The University of Miami held a public lecture by a Francophone scholar named Professor Kaiama Glover (winner of an award from the PEN/Heim Foundation) who specializes in Haitian Literature and Culture on March 5, 2018. Her analysis of media representations of Haiti and Africa shed some light on how benign discourses—from the news media to the Hollywood film industry to humanitarian aid—grant permission for North Atlantic denial of human proximity to peoples of the so-called Global South. Many thanks to everyone who came out and to all of our sponsors at University of Miami (Depts. 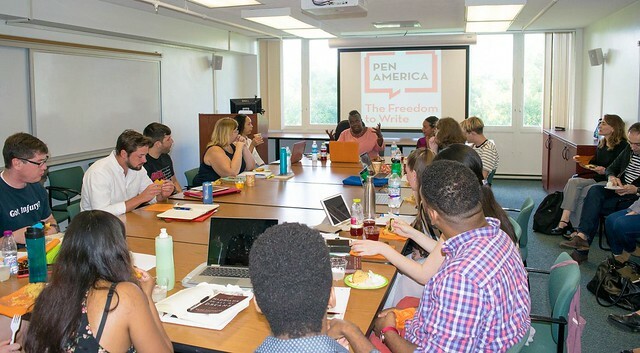 of History, English, Modern Languages, and Literatures; the programs in Africana and American Studies; and The Institute for Advanced Study of the Americas). Lastly, but by no means least, a big thank you to and PEN America and their Press Freedom Incentive Fund. These kinds of collaborations extend critical, civil debates to transform how the media interacts and represents communities in the Global South.